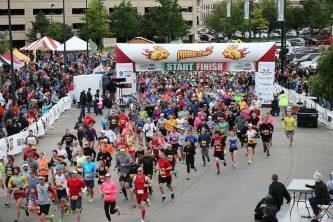 The Prairie Fire Wichita Marathon, organized by the Greater Wichita Area Sports Commission, is committed to promoting health, wellness, and fellowship amongst runners, joggers, and walkers from all walks of life. 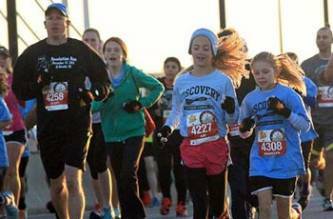 We believe in the positive impact a marathon can have on its community. The Fall Race Series Consists of the following events. All (except the fun run/walk) official USATF Certified races and are electronically time with the BIBTAG chip timing system for both the start and finish of the race. Your race number is also your "chip" for timing. The Prairie Fire Marathon: a Boston qualifier, very flat and fast through the heart of the Wichita Community. All finishers will receive a dry-fit tech t-shirt and race medal. Half Marathon - Finishers will receive Finisher's Medal, Technical Finisher's Shirt. Catch The Fire and sign-up today. There will be a price increase at Midnight, August 31st for the Full, Half and 5K Fall Races. Sign up before September 7th to receive a personalized bib with your first name printed on it.